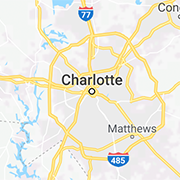 Tour Charlotte area bars, night clubs, pubs, bars, dance clubs and breweries here. You'll find live music, sports bars, dancing and much more. South Charlotte's Best Raw Bar! "Best Drink Specials in Charlotte", and the place to watch the game. Cafe 100 is a family restaurant located in the Huntersville area of Lake Norman. Offering breakfast, lunch & an array of salads, burgers, wraps daily specials & much more! Party Wheels is the premier party bus service in NC & SC. Rentals available for all occasions, including weddings, bachelor & bachelorette parties & much more! The Comedy Zone is a full service Comedy Theater, Conference Center and Special Event facility. Located in the wildly popular North Carolina Music factory the Comedy Zone. "If you can't drop in, smile as you pass"
Cork & Cask is a trendy neighborhood pub featuring boutique wine, craft beer, high-end spirits and unique hand-crafted food that keeps the vibe with an eclectic musical pulse. A Charlotte Soccer Bar & Pub located in Uptown Charlotte. Private Party room available. Dandelion Market provides Uptown Charlotte with a place for friends and family to gather and enjoy the best in food and drink, served with a smile, in a cozy pub setting. The North meeting the South, right in the middle. Uptown Charlotte's favorite neighborhood grille and nightlife spot! Catering is available! Located off Cedar Street in the Third Ward of Charlotte, NC, Draught Charlotte is the area's newest upscale sports & craft beer bar serving lunch, happy and dinner. Fitzgerld's Irish Pub is a Staple in Uptown Charlotte. Located on the corner of 5th St and N. College, we provide great food and a great time. Hotshots Sports Bar & Grill is located in Mooresville and is the perfect place to meet with friends and enjoy great food and cold beer. Burger and brew joint in the Plaza-Midwood area, minutes from Uptown Charlotte. Offering hormone free burgers, fun bar atmosphere and much more. Private parties welcome. We offer a casual Charlotte neighborhood restaurant atmosphere in the heart of Dilworth, right outside of Uptown Charlotte. Charlotte's only AUTHENTIC NYC pizzeria & Italian Kitchen. Libretto's offers family dining, catering and the best in pizza in Charlotte! Private party room available. Located in the Epicentre, Mortimer's Cafe & Pub is an Uptown Charlotte bar offering a unique dining and nightlife experience. Private parties welcome. Pho Real is a Vietnamese Restaurant located in the University area of Charlotte. Piedmont Social House serves as the social hub of Southwest Charlotte, providing the finest in approachable cuisine in a Prohibition-inspired setting. Located in Uptown Charlotte, Prohibition bar and nightclub is back in the form of Charlotte’s newest bar scene and is a hit in the Charlotte Nightlife scene. QCBC is a dual-concept beer growler shop & quick-service hot dog, hamburger and chili counter, located in Uptown Charlotte's historic Brevard Court. Ri Ra in Uptown Charlotte combines a traditional Irish pub with a new world fell. The restaurant is family friendly, entrees mouthwatering and private parties are welcome. Rock University specializes in teaching younger and older music enthusiasts music lessons & offers a recording studio & band rehearsal stage. In Uptown Charlotte, Roxbury Night Club is your ultimate 80's & 90's nightlife experience in the Center City. Available for Birthday Parties, Event Rentals & more. Located at the EpiCentre in uptown Charlotte, StrikeCity offers bowling, full-service restaurant & sports bar, group party options, and more! Located in Historic Southend, Tyber Creek Pub offers the Neighborhood with an authentic pub feel coupled with a unique, chef inspired menu.